A medium-sized arboreal bird, the Indian Grey Hornbill is probably the only hornbill species that can be seen in urban surroundings in India. Usually seen in pairs, it makes for quite a sight when you're driving along a forest fringe and suddenly a pair flies past you, uttering its characteristic, pleasant squeal. A Western Ghats endemic, the Malabar Grey Hornbill sets itself apart from other hornbills by the absence of a casque on a brightly coloured bill. This species has made itself at home in orchards and coffee plantations that are fast replacing its habitat. The Malabar Pied Hornbill is found in evergreen and moist deciduous forests from India eastwards to Borneo. Although primarily a fig-eater, it has an omnivorous diet, often consuming birds and reptiles. It is listed as Near-threatened on IUCN's Red List. The largest and probably the most celebrated among Indian hornbills, the Great Pied Hornbill is a magnificent looking bird, found in most of South-east Asia. Several tribal cultures and rituals revere this species, but this has also endangered its existence as it is killed for its casque. The bird is known to live long, upto 50 years in captivity. Habitat loss and poaching have brought it to the Near-threatened section of the IUCN Red List. The Austen's Brown Hornbill is one of the rarest hornbills of India, found in evergreen hill forests of the north-east. It is omnivorous in its diet, eating fruits, insects, lizards and snails. It is usually seen in territorial flocks of 2-15 birds. 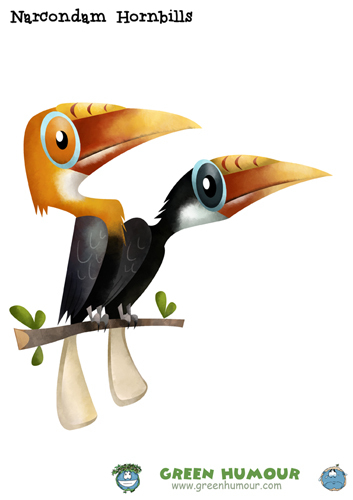 Confined to a tiny island called Narcondam in the Andamans, this species is endangered, with only around 450 birds surviving in the wild (cartoon here). The species shows distinct sexual dimorphism, with the male sporting a rufous head and neck, and the female entirely black. The island of Narcondam has been unpopulated so far, and the protection of this pristine island from human activity is crucial to the bird's survival. 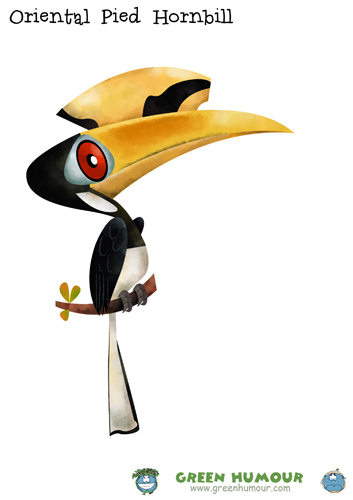 The Oriental Pied Hornbill ranges across South-east Asia and inhabits moist lowland forests. It is separated from the similar looking Malabar Pied Hornbill by the difference in the shape of the markings on the casque. My favourite among Indian hornbills, this beautiful species has suffered from poaching and habitat loss, landing up in the Vulnerable category of IUCN's Red List. A sexually dimorphic species, males sport rufous necks while the females are black. 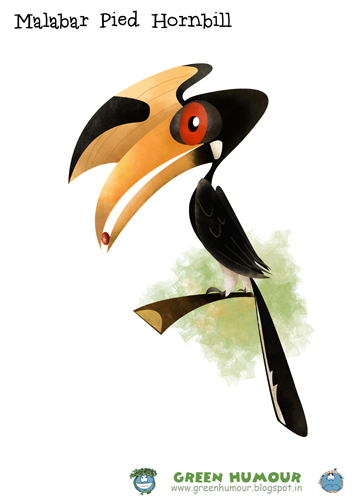 Hill forests of the north-east are the home of the Rufous-necked Hornbill. Also known as the Bar-pouched hornbill, the Wreathed Hornbill too is sexually dimorphic, with males bearing a creamy head and a rufous nape, while the female is black. Evergreen forests of the North-east house Wreathed Hornbills in India. You can email me (rohanchakcartoonist@gmail.com) with the number of prints and your postal address to order these. For orders outside of India, please visit my Redbubble store here. Really good work, Rohan! I'm very impressed by the way you bring out the colors and character of each bird so well through these cartoons! Brilliant!